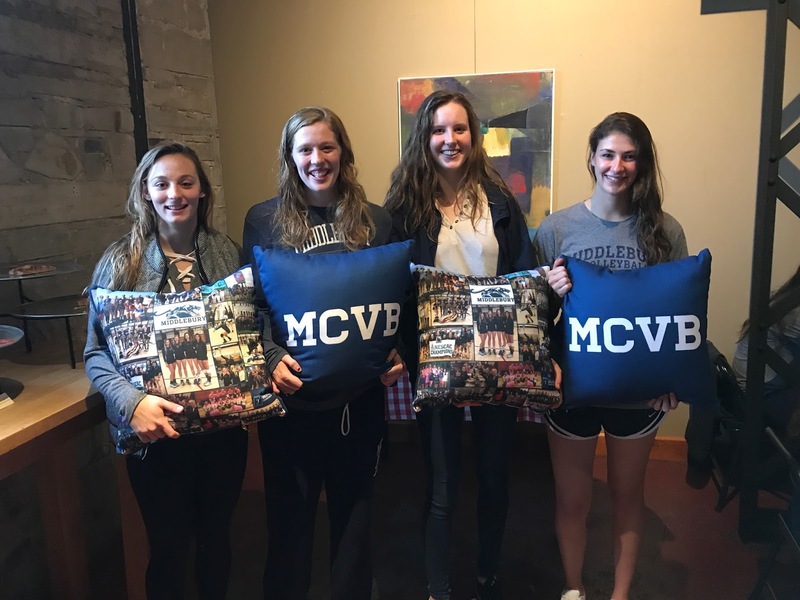 We celebrated our Parent's weekend and Senior Day on our last home weekend when we played Conn and Wesleyan on Oct. 6-7. 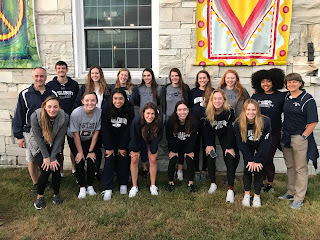 Conn did not pose a serious threat behind their own errors, and a strong outing for us as we hit .241 and registered 18 block assists on the night, in addition to holding them to a -.097 hitting percentage. We cruised to 25-13, 25-13, and 25-10 set scores and were primed heading into Saturday's match up with Wesleyan, since we were both as yet undefeated in NESCAC. We started very strong against Wesleyan, taking the first set 25-19 behind a late surge. We held a tight lead of 21-19 before scoring the final four points for the 25-19 first set win. The second set we jumped out early to a 8-4 lead, and then surged ahead by scoring 9 unanswered points for a 17-4 lead that finally resulted in a 25-11 second set win. They seemed out of sync, and our offense was firing on all cylinders. They changed about everything they could, and by the time the 3rd set rolled around, they were running a 6-2 and had found some of their potent offense that they hadn't displayed in the first two sets. That third set was a back and forth set, and tied at 14-14 they had a couple of late runs to go up 17-14, and 21-15 before closing out the 3rd set 25-19. The fourth set saw them take an early lead and then go up 9-4 before we closed it to narrow margin of 11-9. We kept hanging in there, but trailed by 2-3 points until their final surge put them up 25-19, forcing a 5th set. The fifth set saw us once again get behind early 1-6, and 6-10 before they got to 6 match points, up 14-8. An error by them narrowed the gap to 5 points and brought Isabel into the game and Becca back to the service line, where she stayed until we'd tied it up at 14-14! We showed a lot of fight, and poise and composure in that comeback, but couldn't quite finish it out and lost the final two points for our first Conference loss. It was a rough one, that's for sure. It was parent's weekend, however, so we celebrated as we have for years now at American Flatbread in the Marbleworks plaza. Our student assistant coach, Jack English informed me that he'd been at that event for 5 straight years, four of them as the younger brother of Melanie '17, and now his first as a MIDD student and officially with the Team. 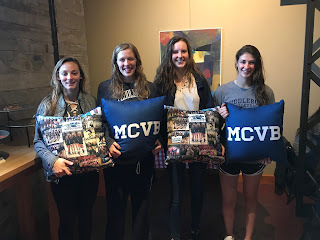 It was a fun night and the senior parents gave the girls very cute pillows to commemorate their MCVB time! Wednesday night we were back on the court facing Skidmore for our final home match of the regular season and we closed out that match in three straight sets. Isabel led the hitting on the night with 16 kills, no errors for a .696 hitting %, followed by Becca with 15 kills and a .323 hitting %. Chellsa was back in the lineup for the first time since Sept. 16th, so that was good to see. Emma has been doing such a great job running the offense that she currently sits at 2nd in the Conference in assists/set, which is no easy feat, so congrats to Emma!! We're back on the road now for the final three weeks of the regular season heading to Boston and then Maine this weekend to play both Tufts and Bowdoin, and picking up another non-Conference match at Bowdoin against U-Maine Presque-Isle. Heading into the toughest stretch of our season, we're excited to be playing some of the best teams in New England the next few weeks (both in NESCAC and in the NEWMAC), preparing us for the always tough NESCAC Championships in early November. LETS GO MIDD!! !